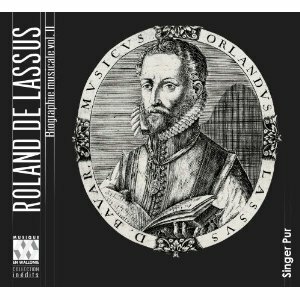 This series is not so much a musical biography as a sampling of music composed during five discrete periods in the life of Orlandus Lassus (c. 1531–94). The biography is in the notes. When we heard the first issue of this five-disc set (Fanfare 35:6) with a different ensemble, the prospect of receiving the rest of the discs was tantalizing. Here are the next two, continuing the choice of less familiar selections from the prolific composer’s work at each stage of his life. The first disc, “the youthful years,” included for the most part madrigals published in 1555 and motets in 1556. The second covers “the time of favor,” from his arrival as a singer at the court of Duke Albrecht V in Munich in September 1556 to three motets published in 1568 and 1569, during which time his official appointment as musical director of the court in 1563 took place. The third disc covers “the time of conflict,” with the rich, noble, and famous composer traveling to France and Italy but annoying his patron, and concluding with a Magnificat published in 1576 and the bicinia a year later. Volume 2 offers a variety of forms, including the Gloria from an unrecorded Missa On me l’a dict; seven motets, all recorded for the first time except O mors, quam amara est and Edite Caesareo Bojorum; a Magnificat supra Tant vous allés doulx; four chansons, two madrigals, and three Lieder. The Lieder, examples of the last genre that Lassus attempted, were published in 1567. At less than eight minutes, the Magnificat is the longest of these selections. Volume 3 includes three movements from an unrecorded Missa O passi sparsi; a Magnificat super Las je n’iray; seven motets, three Lieder, two chansons, one madrigal, and eight bicinia sine textu. The Magnificat is again the longest selection, a little over seven minutes. The bicinia sine textu comprise half of the 24 pieces published in 1577 (the other half are texted). They are not exactly obscure, for two complete recordings (each claiming to be world premieres) have appeared recently on Tactus and Paraty, and several recorded programs have included a selection of them. Both of these discs recount in detail the composer’s biography, citing mostly unrecorded but significant works that illustrate the events. Singer Pur is made up of six voices, joined by two more singers; a guitarist joins in one madrigal. The Egidius Kwartet consists of four voices, including the director, joined by four members of the college, with two gambists playing the untexted bicinia. The three discs heard so far are linked by the annotator, Annie Coeurdevey, whose fine, detailed biographical essays unite the diverse ensembles. The groups have their own styles. Singer Pur, an ensemble of equals, offers cooler interpretations than the other two groups, which each credit one of their singers as the director. But the approach to Lassus of all of these one-voice-to-a-part groups is more alike than different. The addition of so much unrecorded music to the catalog makes this a series to be cherished. These discs are for specialists, to be sure, but they are a refreshing addition to Lassus on record.